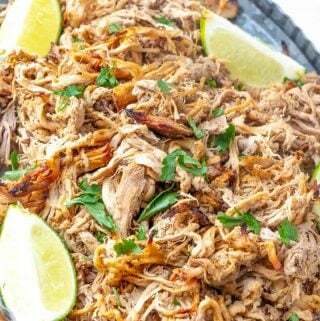 In a bowl whisk together your chili powder, cumin, oregano, salt pepper and cinnamon and then rub on all sides of your pork shoulder. Place pork in a 6-8 quart slow cooker. Add in your bay leaves, garlic cloves and onions. Pour in your orange juice, lime juice and chicken broth. Once cooked, shred your pork in crockpot and cover again and let cook for about 30 minutes longer to soak up juices. Remove shredded pork and place on baking sheet and broil in oven for about 5 minutes until edges get crispy. Serve in your favorite dish.